Predicted Card at PREDICTED NUMBER - a self working miracle! Comes with Bicycle Deck! The magician hands a blue-backed deck to a spectator, who is then asked to name a random number - let's say they say, 15. The spectator is asked to turn the deck face up and slowly deal down 15 cards. Every card is clearly different and the spectator stops at the 15th card. Let's say it is the Ten Of Clubs. The magician shows that, had a different number been named, a different card would have been selected. So that makes it all the more impossible when the Ten Of Clubs is flipped over to reveal that it has a RED BACK! It's the only card from a different deck. However that isn't the biggest shock... that would be the huge number 15 written across the back of the card! Comes with a USPCC Bicycle Deck and full DVD instructions. 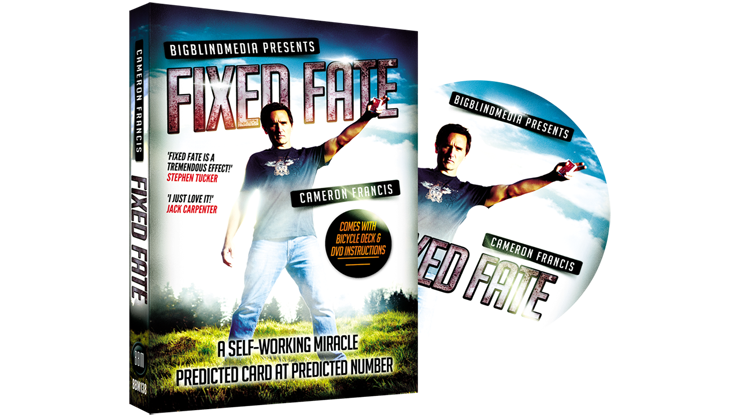 Fixed Fate - you'll be blowing away your audiences in no time! "Fixed Fate is a tremendous effect!"